Ancient Japanese weaponry is famous worldwide for its effectiveness and still has relevance in modern times due to martial arts such as Iaido. The Japanese warriors, more commonly known as ‘Samurai’ became famous all over the world because of their loyalty, honor, and fierce fighting strategies. However, very little is known about the armor they wore which happened to be an important and complex component of their weaponry. This article will go into detail on the history of the samurai armor, the parts of samurai armor, the various types, and where to find high quality samurai armor for sale. The basic armor was developed in Japan in the first half of the 4th century. The Japanese armor evolved from the armors that were used in China and Korea during those times. The Samurai armor evolved from armors known as Tanko and Keiko. The first one was used by the foot soldiers and the second one was used by the cavalry. These were the armors which led to the manufacturing of samurai armor as we know today. Initially, only basic cuirasses were developed in Japan along with the helmets. A cuirass is comprised of 2 pieces, that is, one piece protects the chest and another piece protects the back. Both of these pieces were attached together with the metal strips. During the Heian period which dated from 794 to 1185, a large focus was put on evolving the armors to accommodate warfare at the time, which led to the samurai armor we are familiar with today. The use of leather and lacquer in samurai armor significantly increased during this period of time. During the Heian period, the samurai armor was perfected and was extended to cover the entire body rather than just the upper torso. For a long period of time only leather and iron strips were used to construct the armors but later on, the use of silk lace to connect the individual pieces of armor also became popular. The basic material to construct the armor, however, remained the same which was individual scales made from iron. These individual scales are also known as Kozane. During the 16th century, however, the Samurai armor changed significantly due to the increasing Japanese trade with Europe. The Portuguese introduced Tanegashima to the Japanese, which was a primitive form of firearm, due to which the Japanese armor manufacturers had to change the way in which they constructed samurai armor. The armors up until then were unable to protect samurai warriors from firearms, which necessitated the changes. Instead of the iron strips which were being used earlier, now the samurai armor manufacturers started using iron and steel plates. These were necessary to produce bullet proof armors known as Tameshi gusoku. This enabled the samurai warriors to use the armor and stay protected even in the battles consisting of firearms. Japan entered a peaceful period after the 1600s and thereafter the samurai armors were used a symbol of prestige and status instead of actual war armors. Right up until 1877 these various armor types were being used in japan. Their last use in an actual act of war was in 1877 during the Satsuma Rebellion. Finding authentic samurai armor for sale can be a difficult task and if you do come across it due to the age of the armor it will be merely for viewing purposes only and best as a collectable item. SOTE does offer a few pieces of authentic samurai armor for sale, below are the armor types with links to their site for purchasing (if they’re still in stock) but keep in mind the fragility of these. The Samurai armor consisted of many different parts to cover almost each and every part of the body. Each armor type is different however some of the most common parts of samurai armor are listed below. Dou or Dō – Dou is the armor part which is worn on the chest. It was constructed from iron plates or sometimes leather plates. The dou also sometimes consisted of medals and pendants. The size of the dou would often vary according to the individual who would be wearing it. Kote – These were sleeves which extended from the shoulder all the way to the wrists. Kote was created by putting a cover of clothing over the iron plates of various sizes. The exact size was dependent on the samurai warrior wearing it. Tekko – Tekko are gloves of the armor. They were made according to the size of the hands of the warrior. The construction was done with the help of small iron plates. The plates were joined together in such a way that it enabled proper hand movement including knuckle movements. Haidate – Haidate was used to protect the thighs specifically. Haidate was, however, made with very small iron or leather plates so that the warrior was able to change the posture at a short notice. These plates were connected together with the help of chains and thereafter sewn with a cloth. Suneate – These were the shin guards and consisted of small plates held together by chains and thereafter sewn to cloth and were specifically used to protect the calf. Kusazuri – The kusazuri was also constructed from iron plates or leather plates. It is used to protect the lower body. It usually hangs from the dou. Sode – These are the shoulder plates which are rectangular in shape. They were made from the same materials, that is either leather plates or iron plates or sometimes both. Shikoro – The shikoro is a set of layered steel or leather straps that combined are the neck guard. This attaches to the kabuto and is intended to protect the samurai from any objects aimed at the nape of their neck. Kabuto – Kabuto is nothing but the helmet. Even though it was made from same materials namely, leather plates or iron plates but the number of plates used were much higher, sometimes going up to 100. These plates were held together using rivets. Another part which was attached to the Kabuto is the shikoro which was used to protect the neck. It consisted of curved strips of iron or leather. Wakidate – These were the buffalo horns which were attached to the kabuto. Menpo – This was the face plate which was attached to the kabuto. It was made from an iron plate. It had slits for eyes, nose, and mouth. The rest of the face of the samurai warrior was always covered with Menpo. Tateage (not shown) – Tateage in the armor was specifically used to shield the knees. It was in the form of semi-circular discs, which enabled easy mobility for the warriors. It was generally made from steel plates. Kogake (not shown) – Kogake is a part of the armor which covers the feet. These were made from strips of leather sewn together. Mabisashi (not shown) – This was the plate which was attached to the front of the Kabuto. The plate was made from iron. The function of the plate was to protect the forehead. Yodare-kake (not shown) – The yodare-kake was used to protect the throat. It was made from horizontal rows of iron or leather plates. It was suspended from the bottom of the Mengu which was used to keep Kabuto in place. Mengu was used for tying the Kabuto. Various metal strips were used to tie it and keep it in place. These are the most common parts of the Samurai armor, however each suit is completely different and may compose various other elements or lack some of those I have mentioned here. There are numerous types of samurai armor with vast variations however for the purpose of this article we’ll go over the four most well known; Lamellar Armor, Tameshi Gusoku, Tatami Gusoku, and Okashi Gusoku. Lamellar armor is a samurai armor which dates all the way back to the 4th century. At that time, the armor only consisted of Dou and the helmet. These were made from leather or iron plates. The pieces were held together with metal strips or lacquer. At the end of the 4th century, armor manufacturers also started using silk lace in order to hold them in place. In the 16th century trade between Europe and Japan led to the import and influence of new types of armor. Among these new influences were the introduction of bullet resistant armor to protect the samurai against modern weapons of the time such as guns. This new armor was made from iron and steel plates allowing the samurai warriors to have protection from bullets. The previous two armor types, though were effective in their time, they did have some setbacks; one of which was the weight and lack of flexibility. Since these armor types were stiff and the lacked the ability to fold and be packed away for transportation a need for a ‘foldable’ armor was developed. During the feudal era, this need of portability was fulfilled by the Tatami Gusoku which was foldable and hence could be carried around easily when not in use. The tatami gusoku was worn by all classes of samurai ranging from upper class to lower class. The samurai armor often changed according to the rank of the soldier. Okashi Gusoku was basic armor for the soldiers with a lower rank. This specifically consisted of Dou which was enlarged to cover the upper part of the lower body. These were mass produced and often had the inventory numbers painted on front of them. Samurai armor was constructed with great attention to detail and made significant evolutionary advances from the basic armor of 4th century, all the way to the 16th century when it became bullet resistant. The types of armor vary greatly from country to country and even from clan to clan. Regardless of the type of armor or the time period it is from there’s no debate that samurai armor was constructed with the utmost detail. Now that you know the history, parts, and types of samurai armor, I’ll let you know where to buy samurai armor for those interested in owning their own authentic or replica armor. If you attend a dojo you may ask your Sensei if they are aware of any local shops that may deal in Japanese armor, there aren’t many merchants that do this so don’t be surprised if you don’t find anything locally. Site’s like Ebay may yield some results for individuals looking to sell used or new samurai armor however you are then at the discretion of the seller should anything be wrong with the armor. A merchant mentioned in other posts, Swords of the East also have an extensive selection of samurai armor for sale. Some snapshots taken from their product selection are shown below. They offer new replica samurai armor as well as authentic collector grade armor. One of my favorite looking sets is the CAS Hanwei Samurai Dragon; it is an Edo era replica with excellent craftsmanship, wearable with decent flexibility, and goes well with the Tori Elite katana. The only downside of the Hanwei Samurai Dragon is it’ll run you $5,000+ which if you have the money is a good deal taking into consideration the normal cost of samurai armor for sale, however it’s not something that’s in everyone’s budget. Hopefully this post gives you an idea of the various types of samurai armor, the history of this exquisite armor, and provides some direction for where you can buy samurai armor for yourself. Start you search for high quality armor below! It is well known that samurai have many forms of weaponry in their arsenal used for numerous offenses and defenses of an attacker. The most common weapon of which is the well known katana sword. This sword however is only one of many weapons and equipment a samurai would have at their disposal. In modern times I wouldn’t expect people to be walking around with all of these weapons since there’s a good chance you’ll find yourself in jail for brandishing a weapon. That however doesn’t mean you couldn’t have your own stash of samurai weapons at your home for practice. For those with a strong interest in martial arts that may be curious on what they would need to have what I call the “samurai arsenal pack” or if you’re looking to ideas for someone else these are be top 8 best samurai gifts. There you have it, my take on this year’s best samurai gifts. If you have a martial artist enthusiast you’re buying a gift for either or all of this would be the complete samurai package! Here are our top 5 picks for best movie katanas. We’re starting with every post-apocalyptic survivor’s katana of choice and working our way back through the 47 Ronin sword as well as other highly known katana blades. At the top of the list is Michonne’s katana from The Walking Dead. A great show accompanied by a sleek and clean looking katana, this is the perfect blade for decapitating those unruly undead. Get yours here and get ready for the apocalypse! Custom craftsmanship from sword maker Paul Chen that even Keanu Reeves would be jealous of. The legendary story of 47 Ronin and their battle to avenge their master’s death HAD to make it in our top 5. There are multiple makers of the 47 Ronin sword, some with cheap quality and others such as this with superior quality. Here’s the working custom replica of the 47 Ronin sword. From the bloody Kill Bill serious, this katana has been hand forged and is battle ready. This blade comes with a stand as well as oil and cleaning cloth. Whether you want it as a wall hanger or to use in class you can find yours here. The katana wielded by the mighty Morpheus defies all known logic. Get ready to battle the Smiths and dodge bullets (ok ok so you can’t really dodge bullets) with your Matrix sword here. Change your view of the world through the eyes of The Last Samurai. This blade features beautiful engravings and a sleek saya. One of Tom Cruise’s best performances accompanied by a stellar blade. If there is another movie sword that you think deserves to be on this list let us know on Facebook! 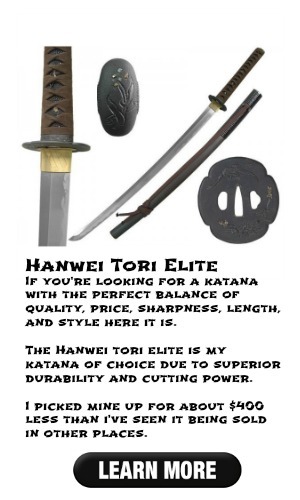 Check out our other Katana reviews for functional swords here.